In which G.M. Norton realises a 20 year ambition. I remember it quite clearly. I was sat in the family home one morning in 1993, watching The Big Breakfast television show when I first caught sight of the Handlebar Club. Men with enormous moustaches filled the tiny television set and I was hooked. “One day, Norton old stick, you will grow a fine moustache and join the Handlebar Club,” said I. Well, ladies and gentlemen, that day has arrived. Huzzah! Proudly wearing the club tie. Pictorial taken by the super talented Adele off of My Last Dollar Dress. Back in March, I breezily announced I had started growing a moustache with the ambition to become a member of this most prestigious of clubs. 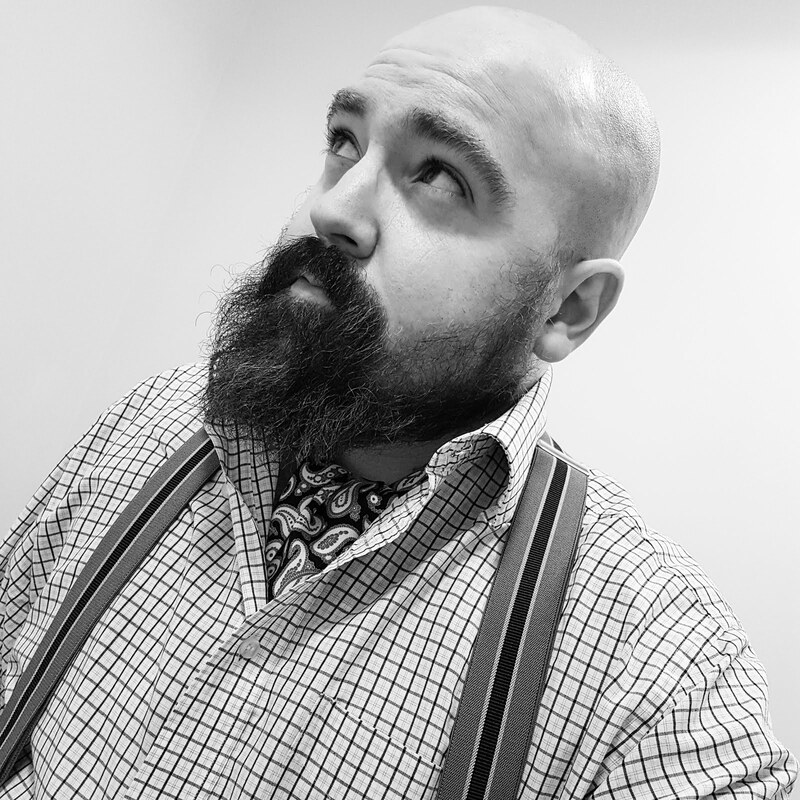 The weeks have passed by thick and fast and the old facial fur has grown thick and fast as well, to the point where there was no denying it – I had achieved handlebar status. 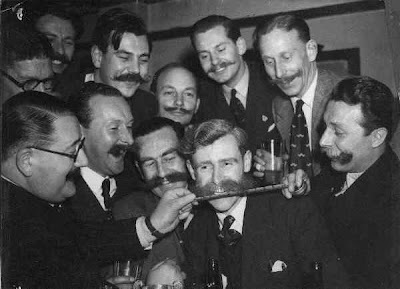 Once I was satisfied, I contacted the Handlebar Club secretary, Mr. Steve Parsons and I was frightfully pleased to discover that my moustache had cut the mustard. 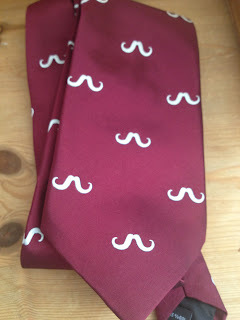 Within just a few days, my club tie had arrived in the post. 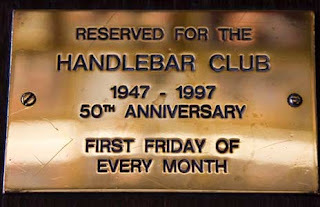 If you’re not familiar with the Handlebar Club, it was formed in 1947. Incidentally, this is the same year my father was born. Many of the founding members were former R.A.F. 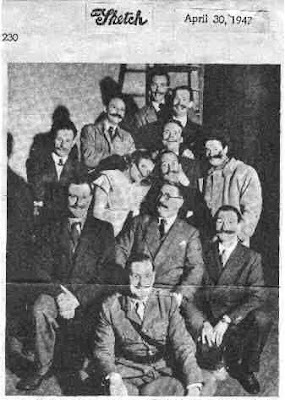 chaps including famous personalities such as actor, Jimmy Edwards (who recently made a guest appearance on this periodical), Frank Muir and Raymond Glendenning of the B.B.C. and cartoonist Bill Hooper. The club was formed for furry fraternising in suitably convivial surroundings (namely, licensed premises). Members of The Handlebar Club also support any worthy charity or cause, especially those devoted to ex-servicemen. Beards are strictly forbidden. 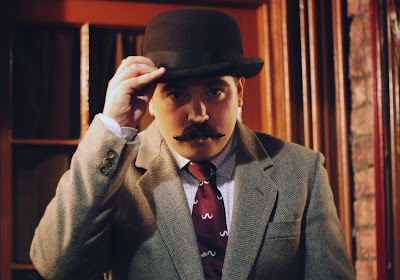 As a friendly sort of fraternity, there is hope if you do not have the prerequisite moustache or if you are far too attached to your beard to consider giving it the old heave ho. 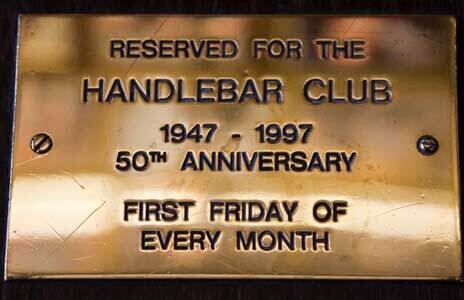 Should your heart desire, you can become a Friend of the Handlebar Club. There is even a rather fetching blue silk tie available. The Handlebar Club convenes a London meeting on the first Friday of the month at The Windsor Castle Pub. Although I reside quite a distance from the Big Smoke, I am already planning my first trip to socialise with my fellow Handlebar chums. Then there’s the Annual General Meeting next year. P.S. 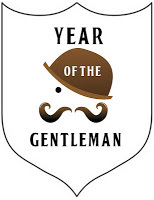 While you have a mo', please do vote this periodical for the Best Vintage Lifestyle Blog category in the Vintage Manchester Awards. That's frightfully decent of you, old fruit. If you are planning a trip and are looking for reasonably priced accomodation near the club meeting pub, I believe there is a Travelodge just outside of Marylebone station (out the front door and look to your right). From there the pub is but a ten minute walk, but I would advise to train your liver thoroughly before hand (and bring a pipe).